ARTIST OF THE MONTH – JANUARY 2016 Constantinos Maleas was born and raised in Constantinople. His first contact with art came when he attended Constantinople’s Great School of the Nation, he continued his studies at the Istanbul Technical University, focusing on architecture. In 1901 he travelled to Paris, where he stayed for six years. In Paris he studied under Henri Martin and attended the École Nationale Supérieure des Arts Décoratifs. He was also the Director of the Museum of Folk Handicrafts in Athens and travelled extensively throughout Greece and the East. Constantinos Maleas was also a founding member of the ‘Techni’ group of artists in, whose aim was to develop Modernism in Greek art. The group was formed in 1917. Maleas’s work mainly comprises landscapes; he created his own style based on Impressionism, Post-Impressionism, Fauvism, Expressionism and Symbolism. 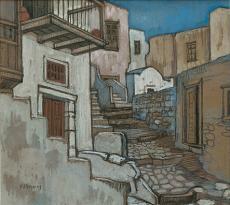 He was also greatly inspired by the pure lines and volumes of continental Greece and the Aegean, creating paintings full of light and colour. Mount Taygetus, depicts a mountain landscape near Sparta, painted in vivid, almost glossy colours, with distinct, visible brushwork and thick layers of paint. 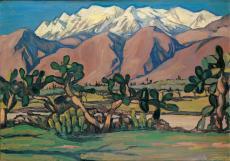 The composition is divided into flat, horizontal sections: in the background, we have the bright blue sky, the majestic snow-covered mountains, and the purple-accented bare brown mountains; in front are bright green and yellow plains divided by a road and a row of dark green cacti. 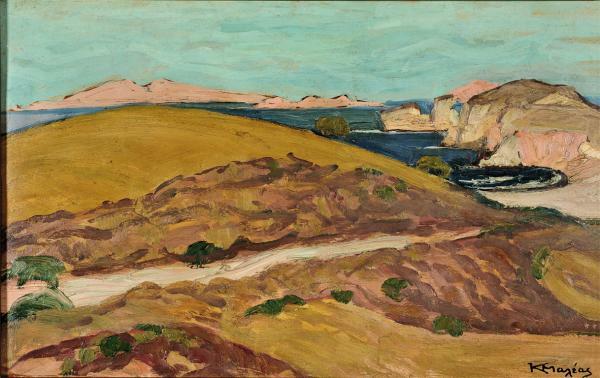 The bold dark outlines and the minimal perspective are especially representative of Maleas’ style, as is the very high and narrow horizon.